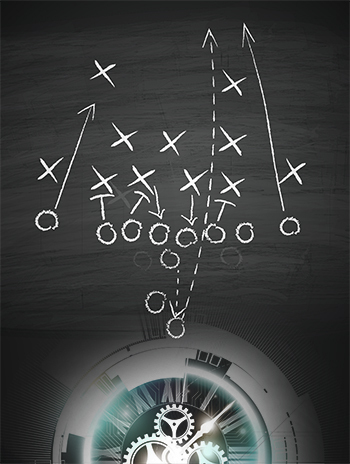 A retirement portfolio without proactive management is like driving a car without brakes. Are your clients prepared for the next inevitable crash? They are probably one of the most important yet most rarely understood topics when it comes to retirement planning. How many times have you sat down with a client, educated them on the basics of sound investing principles and your philosophy of portfolio management, implemented a financial plan, and truly felt as if you’d set expectations appropriately, only to receive a less-than-pleasant phone call just months later when the market experiences a short-term 12% correction? If you’re reading this and it hasn’t happened to you, it will. The first few years of my career feel like yesterday, but, fortunately, I have come a long way since then. In my first job in this business, it was pounded into my head that I needed to find clients and convince them their portfolios (based on some good evidence) were not the right place for them to be. I would then cherry-pick the best investments I could find, based on 10-year track records (using software that made it easy to do so), and then convince the client to “buy” my portfolio management recommendations. They would be “diversified” across asset classes and sectors for the long term in a classic sense to make them feel good, and then I would go out and find more clients. I am not proud of that way of working, looking back at it now. But that is how I (and most other advisors) were initially trained some years ago—to recommend classically diversified investments, tell clients to buy and hold, and keep on building a practice in that fashion. Fast forward to 2008, when I overhauled my entire philosophy on portfolio management. The only similarity between the old, do-nothing, archaic “buy and hope” strategy and my new, tactical, proactive approach was the time frame—it remains long-term. The investing public has been blinded by the metaphorical “food pyramid” of investing. Our clients have been taught—as most financial advisors are taught—to buy, diversify, and hold for the long term. They’ve been taught to have portfolios that are on offense, all-in, all of the time. They’ve been influenced and persuaded by materials produced by the largest fund companies in the world to never, ever sell. But why? I ask our new clients this question often and the response is almost as interesting as the question itself. People usually look at me in a state of confusion as they realize the answer is obvious. If investors sell their funds, the funds don’t get paid! Of course they want you to buy and hold! Those of us who have been through multiple market crashes in our careers have a chip on our shoulders. We’re frustrated with the industry for shoving modern portfolio theory (MPT) down our throats and for turning us all into robotic salespeople when we started. But let’s stop being frustrated for a moment. Those of us who practice tactical, proactive portfolio management and the buy-and-hold, MPT crowd do have one thing in common: a long-term time frame. Buy-and-holders say, “Think about the long term. It’s a marathon, not a sprint.” And you know what? I agree with them. Now, I’ve gotten to know some amazingly successful, intelligent portfolio managers in this industry who do not share this opinion. I know a successful portfolio manager who buys “breakouts” with a 20-day to 50-day time frame. I know another analyst who owns an extremely successful subscription service, and he swing trades with a time frame that lasts between a day and a couple of weeks. One of the traders I most respect in the business often trades the overnight market, staying up all hours to do so very successfully, using his own proprietary algorithms. My point? There are many successful trading strategies that exist that are not focused on the long term. But I’m going to go out on a limb here and suggest that the majority of us who manage our clients’ hard-earned retirement assets are doing so with a long-term time frame in mind. Now money: Clients plan on spending this money within the next two years. It should not be invested in the market or any other risk-on assets. Later money: These are assets for goals with time lines before retirement and assets that are going to be used to provide income after a client retires. Never money: As a fee-only firm, we don’t sell life insurance, but this is essentially what “never” money is: assets that are preserved for the sake of ensuring that a retirement plan doesn’t blow up in their heirs’ faces in the case of an earlier-than-expected passing of one of the major breadwinners in the family. We also have the debatable “risk profile” to factor in. At our office, we like to say that the risk profile provides us with information that suggests what the client wants. On the other hand, a comprehensive, written financial plan tells us what the client needs from a risk-management standpoint. Naturally, we prefer to recommend what our clients need—not what they want. The risk profiling just helps us frame the discussion in the face of potential emotional biases. In my 16-plus years of experience (which included two market crashes), what I’ve learned is that clients both want and, in almost all cases, need to avoid market crashes—plain and simple. All human beings suffer from recency bias. Most investors are losing perspective in this seemingly never-ending bull market. Haven’t you heard that bull markets die on euphoria? OK, sure … you have, but most clients haven’t. And those who have, they forget. Why? Recency bias. It’s pervasive throughout the ebbs and flows of the human psyche. One day, we’ll see another catastrophic crash, and I don’t care if you’re a millennial working with a robo-advisor or a baby boomer working with a Wall Street “buy-and-holder,” I have yet to meet anyone who can tolerate losing large sums of money. When the market is in a long-term uptrend, I want our client portfolios to be aggressively buying pullbacks and corrections, treating them like clearance sales. But again, this is where the similarities of proactive advisors like us differ from our buy-and-hold brethren. But then there is the flip side of the market. 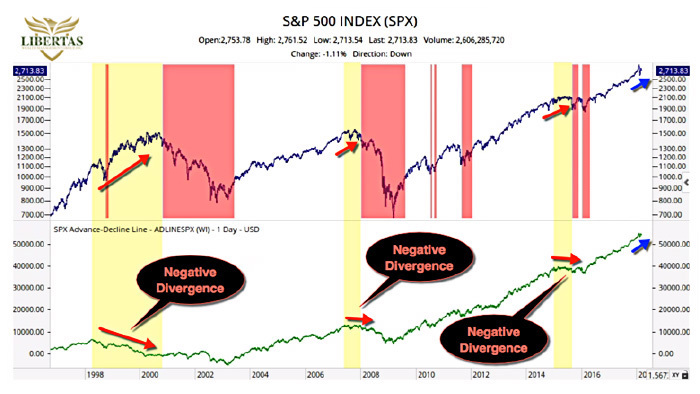 One simple way to identify times when one should exhibit caution—and further, times when one should be completely avoiding stocks—is by observing trends and divergences in price and advance-decline (A-D) lines. It works when applied to the NYSE, NASDAQ, Dow Jones, and any number of other indexes. For this example, we’re just going to use the S&P 500. When the S&P 500 A-D line starts to diverge downward against the upward trend in the SPX, I put up a metaphorical caution flag (see the yellow highlighted portion in Figure 1). You can see how this state of caution took place three different times in the last 25 years, and all three managed to add to evidence of a coming crash, or at least a consolidation period (in the case of 2015–2016), in the U.S. stock market. Taking this a step further, when the 200-day exponential moving average (EMA) on the S&P 500 crosses below the 50 EMA, red flags should be going up. This is another piece of evidence that should warrant taking additional conservative measures in all our clients’ portfolios—perhaps drastic defensive measures, depending on any number of other indicators one might follow when determining the overall long-term trend in the markets. One of the biggest advantages proactive advisory firms bring to the table is the ability and willingness to adjust our viewpoint according to what the market is telling us. Any tenured money manager knows that when you fight the trend, you lose … and the market doesn’t care about what we’ve done. All we should care about is what we’re going to do tomorrow, next week, and next month. Clients are looking for as much up-capture as possible when the market rises and as little down-capture when the market inevitably falls. They want/need a tactical process that aims to avoid catastrophic bear market crashes. That’s it! They may not know it, and it might not always seem this way, but they’re not looking for miracle workers that call tops and pick bottoms. With all that being said, there’s certainly a place for passive portfolio management. If one never plans on spending their money in retirement or has no need for supplemental income in addition to Social Security or pension income, then maybe a passive, buy-and-hold strategy is perfect. After all, if a client is never going to spend any of their hard-earned retirement portfolio assets, they can get all of the upside (and downside) in the market at a low cost through buying an ETF that mimics the S&P 500 Index. However, in my experience, these situations are rare. There are plenty of wonderful, intelligent, and capable financial advisors out there who simply don’t have the time to create a portfolio-management strategy from scratch, test its signals, scan and sift through thousands of charts each week, all while attempting to maintain strong relationships with dozens—or even hundreds—of clients. This is where highly-respected, third-party money managers come in—wherein the type of analysis I’ve described above can be automated for clients, along with a proactive, tactical portfolio-management strategy. Bottom line, whether it’s supplemental income or vacations with kids and grandkids, in the vast majority of cases, clients need to spend their money at some point. To help them safely navigate a successful retirement, we need to guide our clients in taking a long-term, proactive approach to investing their hard-earned retirement dollars. We need to help them focus on the horizon, not their feet, teaching them to measure the distance between retirement and 100 years of age with an odometer, not a ruler! All the while, we need to be watching these long-term trends and mitigating risk when the penalty flags start to fly, when the storm starts to build strength.